Beautifully cut in a gorgeous and on trend jewel toned green fabric, these Marina Rinaldi trousers are a must-have piece. 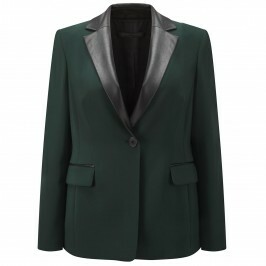 We’ll be wearing ours with the co-ordinating jacket to create a stunning fashion forward outfit but they look equally gorgeous mixed with your black suiting. Pull on narrow leg trousers. 71% Triacetate, 29% Polyester. Delicate wash.